Efforts to develop microscopes that offer “superresolution” capability have a new paragon: Investigators at Stanford University, led by US Secretary of Energy Steven Chu, have devised a technique that permits a resolving power of as little as 0.5 nm, an order of magnitude better than existing optical microscopy methods deliver. Several tools and techniques can see past the diffraction limit of about 200 nm, such as ion-beam microscopy and stimulated-emission depletion. Many of these, however, can be unsuitable for studying biological samples because they emit high-energy beams that harm cells and tissues. Tagging molecules of interest with fluorescent particles, such as dyes or quantum dots, then imaging them with an optical microscope connected to a CCD camera can permit resolutions as low as 5 nm. Chu’s team used this setup as a starting point. The group, comprising Chu, Yunxiang Zhang and Alexandros Pertsinidis, who is now with Sloan-Kettering Institute in New York, noted that the ability of a CCD pixel to register a photon from a fluorescing particle depends on its location relative to the incoming light. An off-center photon doesn’t register as well as one that is more “on target,” and the difference, although slight, results in a blurred image. Using a closed-loop feedback system, the researchers took control of the way fluorescent samples line up with the imaging mechanism. They reported their findings in the July 29, 2010, issue of Nature. Using a closed-loop active feedback system, researchers at Stanford University have achieved imaging resolution close to 0.5 nm. The images on the right show Cy3 and Cy5 dye molecules attached to DNA strands. Courtesy of Lawrence Berkeley National Laboratory. The base of the system is an Olympus inverted microscope. 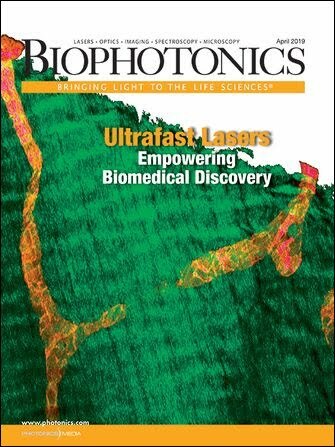 The investigators used a 532-nm laser from CrystaLaser of Reno, Nev., and a 635-nm laser from Thorlabs Inc. of Newton, N.J., for excitation of Cy3 and Cy5 fluorescent dyes, which were attached side by side to DNA samples in the same experiment. To hold the tagged DNA in place, they used a 1064-nm Nd-YVO4 continuous-wave laser made by Coherent Inc. of Santa Clara, Calif., to form an optical trap that tugged one end of each strand away from the mounting surface, where it was tethered. Real-time fine adjustments during imaging were achieved using a specially calibrated three-axis closed-loop piezoelectric stage provided by Physik Instrumente L.P. of Auburn, Mass. To achieve independent regulation of where images from the two fluorophores struck the pixel array of an Andor CCD, the investigators placed custom piezoelectric tip-tilt flexure mirror mounts into the light paths. Moving the stage in subpixel increments allowed calculation of the geometric centers of the fluorophore images, enabling extremely high resolution measurements of the distance between the Cy3 and Cy5 molecules. According to the researchers, the technique may be adopted into other high-resolution imaging systems and perhaps could find use in atomic physics, astronomy and optical lithography as well as in cell biology applications. A microscope designed so that the specimen is located face down above the objective.